I'm running cookie 5.9.4 (mac app store version) on Mojave. I have installed the cookie scripts, disabled icloud, and allowed cookie full disk access. I've told cookie to delete unwanted data (which includes history) on browser quit. For ages i have thought that it's been doing this correctly as when i reopen safari there is no history. I have noticed however that remnants of history remain in the system somewhere because if I do a mac spotlight search, and I enter in a word associated with a website I have been on, the website shows up in the search results list under the "bookmarks & history" category. Only when I "clear history" the proper way in safari options do these search results then disappear. To illustrate this, here is a screenshot of me doing a spotlight search of "sweetp" having been on the website, after quitting the browser and browsing history supposedly being deleted. And no i don't have it saved as a bookmark. Is there something that can be done to fix this, or have I not set something up quite right? have you tried a computer restart? 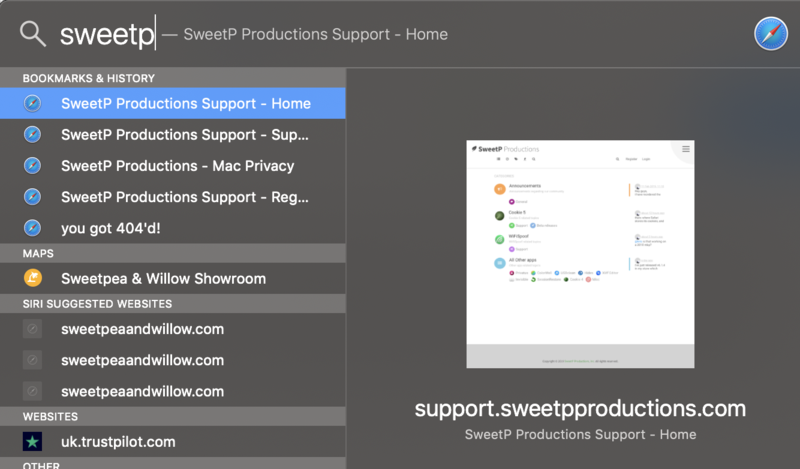 A computer restart does not seem to flush the spotlight database because after restart the safari history still shows up in spotlight. I have also tried disabling the safari option "show frequently visited in favourites", but it makes no difference (although maybe the problem is related to whats going on here..?). The only thing that seems to the flush out the spotlight database is "clear history" in safari. Surely it seems then that safari's method of clearing history is different to Cookie's method. Found a mac system preferences option for spotlight to disable search results in the "bookmarks & history" category, which fixes the issue. Who knows if safari history is still accumulating in this location behind the scenes though.. If so maybe a future cookie update could address this?